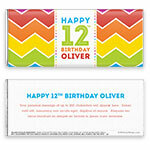 Bright and cheery, this rainbow pattern wrapper is a perfect choice for a variety of occasions. 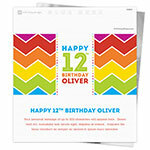 Design: Rainbow chevron pattern with white banner and colourful text. Personalization: Front banner text, back title and message.